Posted on March 23, 2018 by On a Higher Note. Truly a redefinition of the word “Excellence” from all fronts, last night’s event with Joseph Cali at their high end loft in the Gryphon room just off of Union Square in New York gave me the rush to share some quick snip bits. Promise to deliver a proper show report next week with event details, photos and write about our Irish Whisky music pairings. It was a snowy couple days in the East Coast. 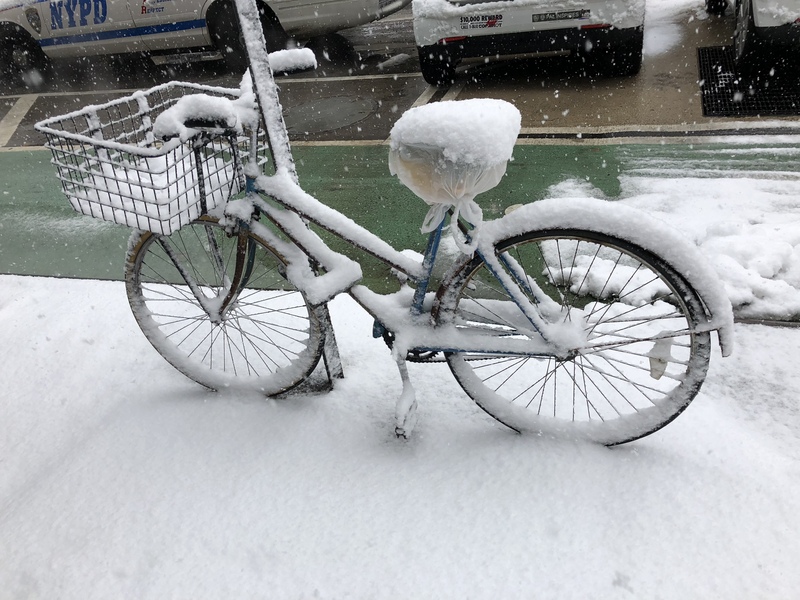 This frozen bicycle on the roadside I spotted during my walk from the hotel struck a chord with me. In anticipation of the snow storm, I thought a before and after comparison of Union Square from the loft shows the sentiment. I was here in February when the Gryphon gear first arrived to help with installation and product training. Using the Gryphon speaker cables and the Artesania audio rack and decoupling systems, we finished the set up with great strides. Moreover, with a single-minded pursuit of excellence, Joe decided to up his game even more by redesigning the space and installed a new wall. The result was superb, both sonically and aesthetically. The highlight of our preparation was watching the rehearsal of Lori Lieberman for her live performance. After her rehearsal, Lori sat down in front of the Gryphon system to sample her recordings using the Gryphon Scorpio CD player as the music source. Seeing her smile beam from ear to ear as she listens to her own CD meant more than any spoken words. Besides the sonic virtues, the thoughtful and deliberate adornment of this high end loft showcases harmony music and art create in our personal space. Embellishing Gryphon’s emotional delivery of musical performance are two genres of artwork, adding color to compliment the “lush and chocolaty” feel of the sound, with watercolor originals by Kim McCarty, Lori Lieberman’s sister, and photographs by Barbara Bordnick. Launching Gryphon Audio in New York was the cause, the love of music was the bond, music connoisseurs’ passion for excellent music playback was the fuel. The result was a memorable event that redefined the word “Excellence”, with a rich sound stage with tone and timber that felt like the artists were in the room. There were many more notable moments with many special guests blessing us with their presence. We will follow up with Part II of this write up with a proper show report. Call Joseph Cali Systems at 212-505-1111 to schedule your own audition. Please write to us >>> here >>> to let us know what you think! This entry was posted in Philip's Musings, Show Reports and tagged #BarbaraBordnick, #KimMcCarty, #NewYork, Gryphon, Gryphon Audio USA Event, Joseph Cali, Lori Lieberman, Music.